California’s longest-serving trial court judge found his calling in juvenile justice. 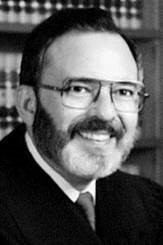 Los Angeles County Superior Court Judge Morton Rochman has been on the bench since the advent of the personal computer. He has even spent most of his career in the same courtroom. Rochman, 85, still presides over cases in Sylmar’s Juvenile Court, making him the longest-serving trial court judge in California. His extensive career is the product of a childhood dream that once felt out of reach. Rochman was born in Chicago to Russian immigrant parents who could not read or write in English when they arrived in the United States. Rochman was the first in his family to graduate from college and earned a law degree from the University of Illinois College of Law in 1956. He spent more than a decade as a deputy public defender before then-Governor Ronald Reagan appointed Rochman to the Los Angeles Municipal Court in 1971. He became a Los Angeles County Superior Court judge in 1985. Judge Fred Fujioka, who has worked along Rochman for more than a decade, said his colleague’s “unruffled, caring and compassionate” demeanor makes him perfectly suited to deal with the difficult cases that come before him in juvenile court. Rochman answered questions from his chambers this week about how juvenile justice has changed during his tenure and what advice he would give new judges. Q: You said you hoped to serve a few more years as a juvenile delinquency judge—that was in 1994. What motivates you to stay on the bench? I’m very fortunate to have in this facility outstanding defense attorneys and prosecutors. It can be a thankless job, but they do it. The interaction with the attorneys, my fellow judges, the court clerks and the bailiffs energizes me every day. I look forward to coming to work in the morning. It sounds like a cliché, but it’s true. Q: Juvenile justice can be emotional work, with high burnout rates. Does it help to be an optimist? A: Oh, yes. I’d consider myself a realistic optimist. Sometimes, the tears are flowing in the courtroom when we have the moms and the dads and the victims there. I try to keep an even keel, to not get too high or too low emotionally. I know most young people never see a juvenile court. And a small handful might have made a bad decision; they come to my court once and never again. The concern is those who we see over and over and the files get thicker and thicker. That’s hard. We want to try to get them into a more productive lifestyle rather than see them go into the adult criminal system. Q: What’s been the biggest change in your 46 years on the bench? A: The biggest change I see here in my little corner of the world–juvenile court here in Sylmar–is that we are relying more and more on using community resources to help the young kids, supervised by the probation department. They work with families, go into the homes, and provide access to counseling and therapy. We have a school counselor on site that helps with education. We know the stepping stone to any future success is education. We demand a high school education. We push that all the time. Q: What advice would you give new or aspiring judges? A: I think a new judge must learn, learn, learn all the time. Things change very quickly. When I started, my clerk wrote everything by hand. Then, I got a computer in my courtroom and I had to learn how to use that. Now, our goal is to eventually go paperless in juvenile court. Q: What do you do when you’re not on the bench? A: No surprises, but I’m a Cubs fan. I watched the World Series on television, and I couldn’t control myself. I was dancing and screaming and yelling. I also read a lot. I find my interests are mostly in crime stories—mystery stories and crime novels. Also, contemporary history. I can’t wait for Ken Burns’ PBS documentary series on Vietnam. Q: Who would you want to play you in a movie about your life? A: Have you seen the Bosch series on Amazon? That guy [Harry Bosch, played by actor Titus Welliver], he’s tough. He plays a robbery-homicide detective. He’s my hero. And I’ve read all the books by Michael Connelly. The interaction with the attorneys, my fellow judges, the court clerks and the bailiffs energizes me every day.